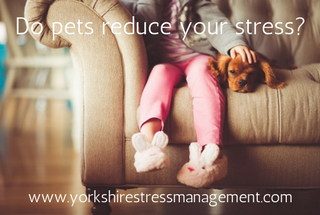 Can having a pet help reduce your stress levels? Many people have observed that their stress levels drop when they have a pet. Various organisations such as Pets As Therapy and Veterans With Dogs have used this knowledge for years, bringing pets to vulnerable people, and seeing excellent results in mood improvement. Those who own a dog are also far less likely to die within a year of having a heart attack than those who don't . Peer-reviewed science is now backing these observations up.